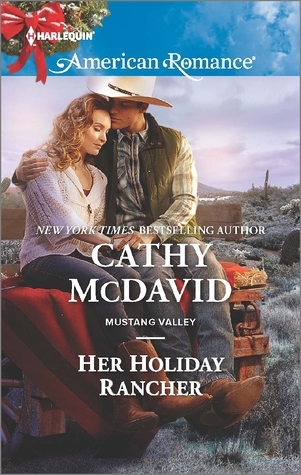 Her Holiday Rancher by Cathy McDavid is the story of Gabe who has been struggling to keep his ranch afloat but after his father's death, he is now faced with sharing the ranch ownership with his two half brothers both of whom want him to sell. Determined never to sell, his only supporter is Reese who is also the trustee of his father's estate. Caught between his pledge to save the ranch, his growing feeling for Reese and also feeling like her support is a conflict of interest, what will happen to Gabe? Will he be able to save his ranch and his heart? I have enjoyed Cathy McDavid's previous books and this one was not an exception. Engaging, written with heart and full of drama, this book had me interested and glued to my seat throughout. I enjoyed meeting the Dempsey brothers and enjoyed following Gabe and Reese as they sorted out their feelings and their lives. The story is developed beautifully and the author managed to transport me to the settings of the book making me feel like I was there. The pace is fast and there is never a dull moment. All in all, Her Holiday Rancher by Cathy McDavid is an enjoyable story that had me entertained and left me wanting to read the stories of the other characters in this book soon. 4 out of 5 to it and recommended to all romance lovers.